In 2004, a Royal Decree assigned a zone for the production of electricity in the Belgian section of the North Sea, known as an Exclusive Economic Zone (EEZ). Then, in 2008, the European Union (EU) put in place a new Climate Plan, stating that 13% of Belgium’s power had to come from renewable sources by 2020. C-Power, a Belgian-based wind energy corporation, had seen this coming. A year prior to the Royal Decree, they had started the Environmental Impact Assessment (EIA) process, a scientific report reviewing the potential impacts of a proposed project on its surrounding area. The Management Unit of the North Sea Mathematical Models (MUMM) wrote this report and submitted it, along with a letter of approval, to the Belgian Government. MUMM concluded that there would be minimal impact on the surrounding environment, but due to the lack of studies done at that time, decided that they would monitor the wind farm’s effects from then on. After all, it is easier to monitor and interpret the data of something that’s actually happening than it is to try to predict future outcomes without much previous knowledge to work with. Senvion’s 5M Model. By Tony Zech (Own work) [CC BY-SA 3.0 (http://creativecommons.org/licenses/by-sa/3.0)]. Because this project was one of the firsts of its kind, C-Power used this first phase to demonstrate the capabilities of larger-scale wind farms, hence why they named it “Demonstration Phase.” They started off with just six 5 MW turbines that allowed for easier monitoring and mitigation in case of unforeseen consequences. It also gave Senvion, the turbine manufacturers, time to create a more efficient model, the 6M, based on how the 5M model had operated. 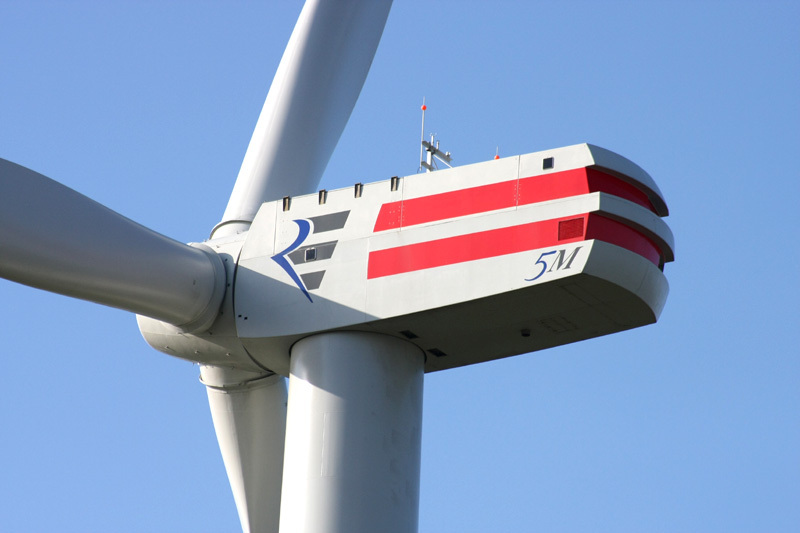 The 6M came with higher voltage capacity, more efficient cooling functions, and a handy 1.15 MW of additional power (“Wind Turbines,” C-Power). 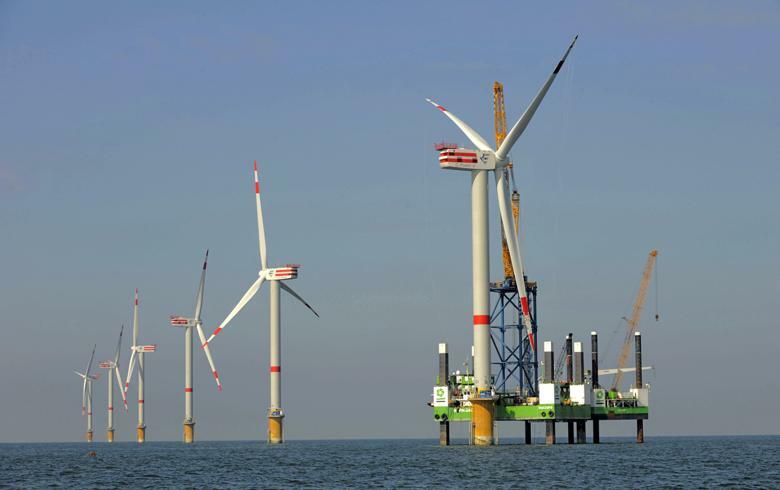 Given an already established EEZ, MUMM’s go ahead, and the EU’s new Climate Plan, C-Power applied in 2008 for a concession to build their much-anticipated wind farm. The EU granted them a domain concession and an environmental permit, allowing them to build and operate one. The concession area for C-Power is located on the Thornton sand bank of Belgium’s continental shelf, about 30 kilometers from shore. Thornton Bank was the first wind farm in Belgian waters. Part of C-Power’s agreement with the EU involved participating in a mandatory five-year monitoring program, and in 2008, they provided MUMM with the funds to begin. This program ensured the government power to mitigate or even cease the activities of an MRED in the event of extreme damage to the marine ecosystem. It also allowed them to better understand the environmental impact of offshore wind farms, thus helping guide policy, management, and design of future MREDs. The studies’ results were published yearly from 2008-2013 on MUMM’s website. Phase 1 began in 2007, but installation didn’t begin until 2008,and it wasn’t until2009 that the first six turbines went into operation. During the installation of Phase 1, the developers noticed that the gravity-based foundations (GBFs), conically-shaped concrete structures that support turbine bodies, were not very sustainable—time- and man-power-wise, that is. Installing them was very man-power intensive, logistically complex, and many of their preparation works were subject to weather risks amid the harsh waters of the North Sea. They had studied the environmental conditions of the area, but only so much could be predicted beforehand. Hoping this would be the first of more phases to come, they quickly set to find a more sustainable foundation model. They hired Smulders, a Belgian engineering firm, to design a steel foundation that worked better within the environment of the Thorntonbank. What they came up with is called a jacket foundation, a steel structure with four legs connected by braces and grouted to pin piles driven into the sea soil. These jackets were faster to fabricate, allowed for more runtime, and only required two installation vessels during assembly (“Jackets,” C-Power). Because less harbor space was needed, they were able to fit thirty turbines during Phase 2 (2011-2012) and eighteen during the 3rd and final phase (2012-2013). C-Power submitted another EIA request in 2009 to account for the improvements that had been made in Phase 2. A Benthic Ecosystem Quality Index (BEQI) was used to evaluate the changes to the benthic community’s characteristics that had occurred with the installation of Phase 1, as well as to predict any further changes with the installation of Phase 2. They compared the the construction site of Phase 1, known as the impact area, to surrounding control areas. They found that the benthic characteristics in different sub-areas of Thorntonbank’s concession area “corresponded with those observed in the control areas . . . except in sub-area A” (“Executive Summary,” Degraer et al.). Sub-area A was the impact area, and the results showed alterations in benthic diversity in 2008, the year the project was being constructed. However, in 2009, the benthic characteristics again showed a high correspondence to those in the control areas. This meant that, after only a year, the benthic community surrounding the wind farm was improving. Planning, installing, and operating a wind farm requires an exorbitant amount of resources. Of all the resources needed, money is arguably the hardest to acquire. These projects are large-scale, and they require equally large-scale funds. Seven commercial banks invested in Thornton Bank, and it wasn’t until 2010, two years after installation of Phase 1 began, that the project reached financial closure. The total development cost for all three phases was €1.3 billion (4C Offshore, 2013). The technical aspects of this project are plenty and hard to fully grasp without an engineering degree. A 33 kV cable network, with a total distance of 50.75 km, is laid in between 54 wind turbines in 2 separate sub-areas and connects to the offshore transformer station (OTS) 40 km from shore. The OTS was implemented during Phase 2 and is used in order to restrict losses during transport over long distances. Two submarine export cables, drilled 30 m below the surface by means of horizontal directional drilling, connect the OTS to the onshore substation power grid “Sas Slijkens” in Ostend through the use of two additional land cables. Even more cables, both land and export, connect “Sas Slijkens” to a high-voltage switching station in Bredene (“Injection at Slijkens,” C-Power). Between the two subareas, there are 54 wind turbines, with a nameplate capacity of 325.2 MW. Their run time is 8,440 hours per year, or about 96% of the time. Around 3,300 of those are spent running at full power. By using these turbines instead of fossil fuels to generate energy, around 450,000 tons of CO2 emissions are avoided. This is equivalent to the annual CO2 absorption of a forested area of around 65,000 hectares, or one-third of the forested area within the Flemish region. Thornton Bank’s annual energy generation is around 1,050 GWh, enough to power around 300,000 Belgian homes (“Project Details,” C-Power). Thornton Bank has been fully operational since 2013, and hopefully its continued success will inspire future offshore wind projects in other parts of the world. Georges Pichot. 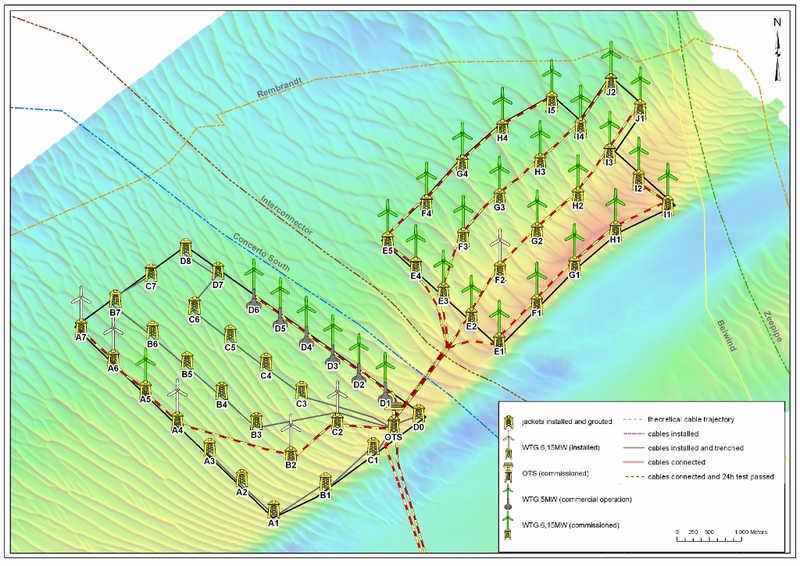 “Environmental Impact Assessment.” Offshore Windfarms in Belgium. (Ed.) Management Unit of the North Sea Mathematical Models. Royal Belgian Institute of the Natural Sciences, n.d. Annex 2. Web. 14 July 2016. C-Power Offshore Windfarm on the Thorntonbank. C-Power. C-Power, n.d. Web. 13 July 2016. “Foundations.” C-Power Offshore Windfarm on the Thorntonbank. C-Power. C-Power, n.d. Web. 13 July 2016. “Jackets.” C-Power Offshore Windfarm on the Thorntonbank. C-Power. C-Power, n.d. Web. 13 July 2016. Degraer, S., Brabant, R., Coates, D., Courtens, W., Derweduwen, J., Di Marcantonio, M., Fettweis, M., Francken, F., Haelters, J., Hostens, K., Houthave, R., Kerckhof, F., Melotte, J., Onkelinx, T., Reubens, J., Rumes, B., Sas, M., Stienen, E.W.M., Vandendriessche, S., Van den Eynde, D., Van de walle, M., Vanermen, N., Vanhulle, A., Van Lancker, V., Verstraete, H., Vincx, M. & Jacques, T.G. “Executive Summary.” Book of abstracts: an overview of marine research in Belgium anno 2009. (Ed.) Mees, J. et al., 2009. 1-8. Web. 14 July 2016. “Global Offshore Wind Farms Map.” 4C Offshore. 4C Offshore, n.d. Web. 13 July 2016. “Global Offshore Wind Speeds Rankings.” 4C Offshore. 4C Offshore, n.d. Web. 14 July 2016. “Thornton Bank Phase III Offshore Wind Farm.” 4C Offshore. 4C Offshore, Sept.-Oct. 2013. Web. 13 July 2016. Walday, Mats, and Tone Kroglund. “The North Sea.” — European Environment Agency. Norwegian Institute for Water Research, 19 Apr. 2016. Web. 14 July 2016.